We had some leftover roast chicken one weekend dinner, and the following day I was thinking about what to do with it. 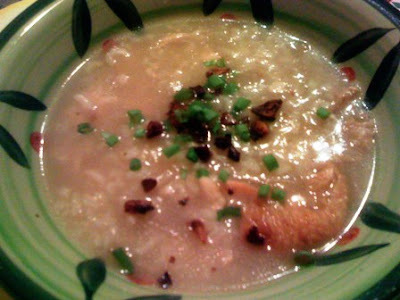 From lunchtime all through the afternoon, I thought it will be great to have arroz caldo with it, that rice porridge with chicken that's considered by many a Filipino as comfort food, especially on rainy afternoons. I love mine with patis (fish sauce) and calamansi. And while there's no calamansi here (and lemon just won't cut it), I'll still have my arroz caldo. 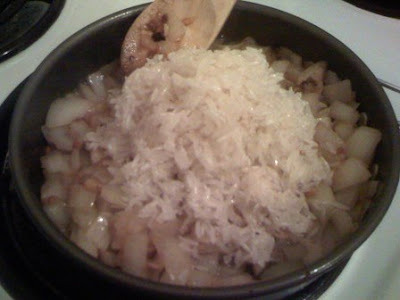 So after having dinner that night, I proceeded to make Arroz Caldo from a recipe book I found in the library. One of the mysteries of this dish is how much water to put in. My Nanay always seemed to know how much to put in without measurements! This recipe solved that dilemma. 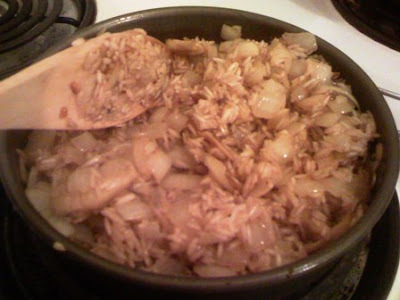 Strangely enough, it calls for stir-frying the uncooked rice before pouring the water in. That's not how we did it at home. It worked out all fine, though. Heat 2 tablespoons of the oil on a pan over medium heat and stir-fry half of the garlic, followed by the onion and the ginger. The other half of the garlic will be used for garnish. 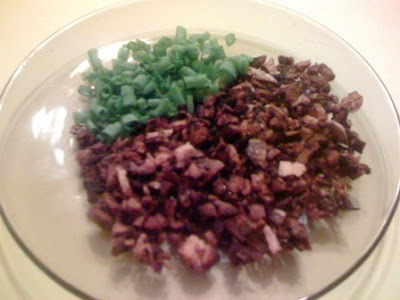 Add the uncooked rice and stir-fry for 5 minutes until lightly browned. Transfer to a pot and add the water. Increase heat and bring to a boil, stirring occasionally. While waiting for the dish to cook, heat up the remaining oil and stir-fry the rest of the garlic until golden brown. Set aside. When the rice and chicken are cooked, season with salt and pepper. I did not place much salt in mine, because I like pouring a bit of fish sauce on it when served. Serve hot with golden browned garlic, spring onion, some patis, and calamansi on the side.